The Y.W.H.A. was founded in Homestead in early 1912. 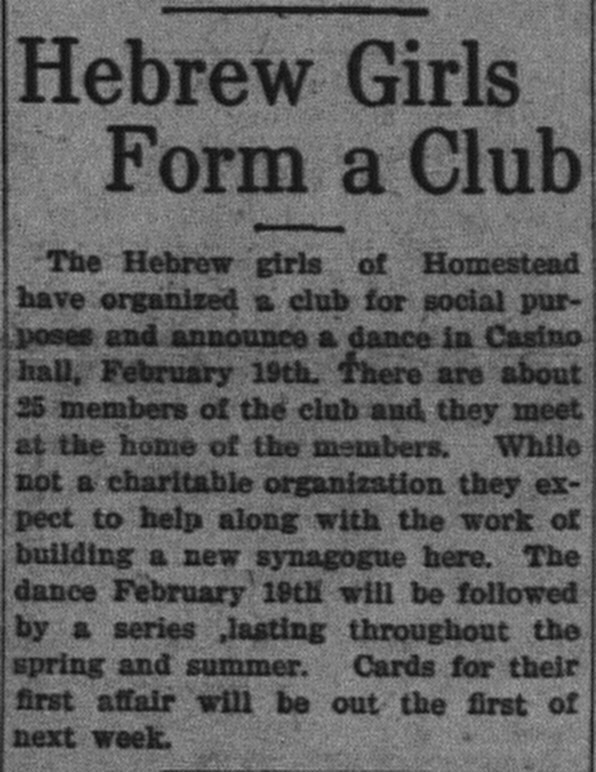 1 After the Daily Messenger reported that, “the Hebrew girls of Homestead have organized a club for social purposes” (below), a later mention that, “on Tuesday evening, March 19th, the Young Women’s Hebrew Association of Homestead will hold their first dance and reception in Casino hall in Eighth avenue” (3/18/1912) confirms the identity of the new group. Besides meetings, their earliest events included mostly dances, but also a sleigh party, a couple bridal showers, and a bazaar One of their dances was an armistice dance on 11/11/1919 (WWI ended on 11/11/1918). Welcome, by Rose Glick, president of the Y. W. H. A.; Valentine Sketch, by the Y. W. H. A. members; solo dance, by Harriet Greenstenn; musical dialogue, by Belle Freed and Florence Miller, accompanied by Lenora Mehalowitz; reading, by Helen Sisenwain; a musical act, by “The Siren Trio,” comprising Belgrade, Funk and Reiter; Charleston dance, by Herbert Hepps and Rose Rubenstein; Ukeele songsters, by Joseph Salera and Sheffild Freedman; solo dance, by Miss Landau, and a sketch entitled “Reminiscing,” by the Y. W. H. A. members. The organization is more than fortunate in securing “ The Siren Trio,” who will add spice to the program. And mid-1926 they donated a piano to the synagogue! 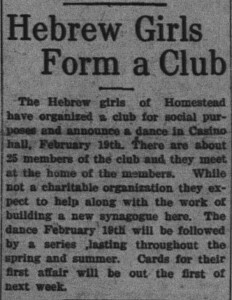 They were also at the forefront of the movement to established a Jewish community center in Homestead (more below). Into the early 1930s they continued to re-elect officers; but their public programming faded. And then Rabbi Pinkas came… (also more below). There is a clear founding date for the Y.M.H.A., October 25, 1914, as was reported in the Homestead paper (below) and Criterion. Besides meetings, their earliest event was a “smoker” during which they heard a lecture on eugenics. They also quickly organized a basketball team. They held dances, a box social, and a “bazaar and mock trial”?! From the late teens, just after the boys returned from WWI in late 1918, there is evidence of joint activities between the two groups. 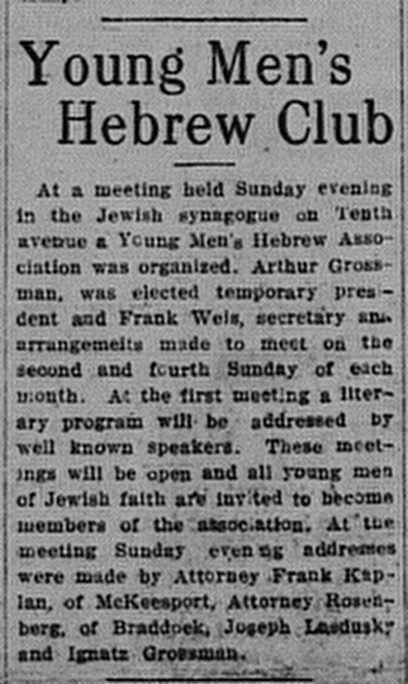 The first mention I was a join open meeting and membership drive in January 1919, followed by a dance in February. In 1923 they had an open joint literary and social meeting, as well as a box social. They had another joint meeting in 1924. They worked together with other community organizations for community-wide events like Mother’s Day celebrations and Purim Masquerades. Then Rabbi Pinkas — a young, single man — arrived in September 1931. 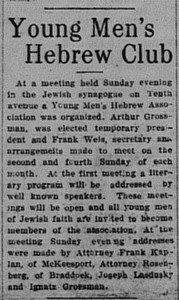 On November 6, 1931, The Jewish Criterion reported, “The entire Homestead Jewish community is undergoing a thorough re-organization since the coming of Rabbi A. M. Pinkas (Kellerman). Under his leadership of Y. M. and W. H. A., and a Junior Rodef Shalom has been organized and are now engaged in laying out complete programs of activities for the coming year. These programs will include plays, entertainments, public discussions and debates on Jewish history and current events, and arrangement of late Friday evening services in the Synagogue.” Starting the following month, events began to reported as activities of the new, joint Y.M. & W.H.A., such as a parents’ testimonial banquet, annual spring festivals, plays, speakers, music, mother’s day celebration, a Lag B’Omer party, and even an athletic tournament — and, of course, dances. They fielded another basketball team in 1934-5. In 1932 they also oversaw the scouts. A dance held on 11/20/1935 was the last activity of this group I saw mentioned. For reference, AZA was founded in 1933, and BBG 1940. Why were the Y groups replaced by the B’nai B’rith youth groups? Did people age out? Were they no longer trendy? (I also saw phases in general fraternal groups in Homestead as well.) Or did Rabbi Pinkas get too busy with his young family to keeping nudging these groups along?